A small crib is a life saver if you are short on space. I know what it's like to have a small baby nursery to work with - my first one didn't even have a closet! It's so frustrating - there are so many gorgeous baby goodies calling to you from out there, but where on earth are you going to fit them all? Luckily there are unique nursery furniture options that can save you space. One of these is the mini crib. It is substantially smaller than a standard size crib, and baby will be ready to move into a bed before she outgrows it. The Annabelle 2-in-1 mini convertible crib. Converts to a twin size bed - Dimensions: H-43.5", L-38", W-25.25"
Shown here in red. Also available in white, espresso or ebony. The Emily 2-in-1 mini convertible crib. Converts to a twin size bed - Dimensions: H-38", L-40.5", W-28"
The Alpha mini rocking crib. Features rocking function - Dimensions: H-35.5", L-39.75", W-26"
Shown here in cherry. Also available in white, natural or honey oak. 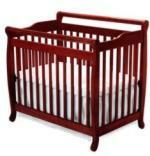 Standard cribs have roughly the following dimensions at a minimum: H-52", L-58", W-31". So, as you can see, there is a saving of approximately 20" on the length of a mini crib. 20" can go a long way in a small baby nursery! Now also available, the Da Vinci Kalani Small Crib! Delta, Dream on Me and Orbelle are just a few of the other available small crib brands.